Franklin County Sheriff Scott Nichols, Sr., at right, speaks to the Committee on Criminal Justice and Public Safety at a hearing held Feb. 25 on the proposed bill to bring Franklin County's Detention Center back into full service. On Monday, 11 members of the committee unanimously voted the bill down. 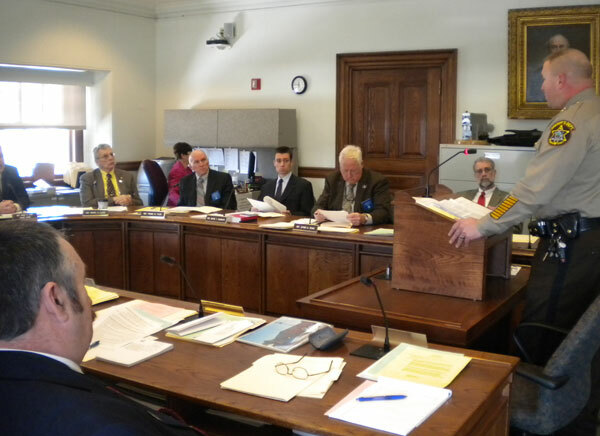 FARMINGTON - A bill that sought to return the Franklin County Detention Center to a full service county jail from its current 72-hour holding status was effectively killed by a legislative committee's unanimous vote on Monday. Meanwhile, officials at the Franklin County Detention Center are once again scrambling to find a jail to house its prisoners since the Somerset County Jail officials announced they will not be taking any more. As of Tuesday afternoon, the center's manager said he's called all the jails and not one can take the detainees currently held at the Franklin County facility. On Monday, 11 members of Committee on Criminal Justice and Public Safety unanimously voted that the proposed bill, LD 238, An act to designate the jail in Franklin County as a jail rather than a holding facility, "ought not to pass," according to the committee's clerk, Suzanne Armstrong. Two members not present at Monday's session still need to submit their votes, but the 11-0 vote means the bill goes no further, she said. The bill was sponsored by Sen. Thomas Saviello, R-Wilton. "This has been very, very frustrating," Franklin County Sheriff Scott Nichols, Sr., said of the committee's vote on Tuesday. The news comes on the heels of neighboring Somerset County's refusal to house any new prisoners from out of its county because the state has withheld its third quarter payment. One year ago, the Somerset County commissioners voted to no longer accept state prisoners for the same reason. That county's jail, located in East Madison, is the primary holding facility for local prisoners, since the Franklin County Detention Center, once a full service jail, had been designated as a 72-hour lockup in 2009. From last spring to midsummer 2012, Franklin County ended up transporting detainees, both pre-trial and sentenced prisoners, two hours away to Two Bridges Regional Jail in Wiscasset. Former Sheriff Dennis Pike described the solution at the time as being untenable, both financially and in terms of public safety. Nichols said currently there are 31 Franklin County prisoners housed at the Somerset County Jail which he is told they can remain there, but no new prisoners will be accepted until the state's payment is made. Doug Blauvelt, the detention center's manager, said Tuesday he was working to find a place to house the six prisoners, some of whom will hit the 72-hour time limit stay in Franklin County on Wednesday. "We've been calling all afternoon and we've been turned down by all the other jails," Blauvelt said. Michael Tausek, executive director for the state's Board of Corrections, said on Tuesday the board voted to withhold the general fund payment to the Somerset facility for the third quarter until he and the Attorney General's Office lawyers can look into the legality of Somerset County using federal revenue to pay down its debt service. The U.S. government payment is to house its prisoners at the jail. Tausek said he's meeting with the AG's Office personnel and Somerset County jail officials to discuss the matter. Somerset closing its facility impacts the entire county jail system, Tausek noted, as county correctional administrators are forced to find beds in other locations. If a jail in another county is found willing to house detainees, the home county has to provide for the transportation to and from the jail, which can quickly add up to more overtime, increased transportation costs and wear and tear on the transporting vehicle. "It results in a logistic difficulty," Tausek said and he added, "It's created more work for the Franklin County staff." Franklin County Detention Center in Farmington. With the proposed bill to revert Franklin County's Detention Center back to a full-time jail now a dead issue, Tausek said the Board of Correction's working group subcommittee is currently reviewing a plan submitted by Franklin County that would allow its facility to do what the bill sought to do. "There's a lot of information in the plan; it's very labor intensive," he said of the review process. The BOC's working group has asked for additional information which includes the staffing plan should the jail go back into full service. The annual budget for the Franklin County detention facility is set by the state at $1.6 million, with those funds raised by the county's taxpayers. Nearly $1 million of that total is used to fund operations at the facility. The balance totaling $600,000 is sent to the state for operations of other correctional facilities. 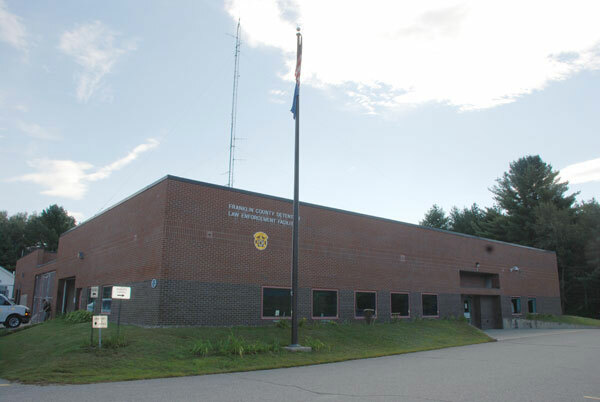 Budgetary information for the proposal submitted to the BOC states that the county could operate the jail at its previous capacity for less than $1.6 million a year. The bulk of the savings, Nichols testified at the public hearing on Feb. 25 for the bill, would be moving from a full-time staff of four, which the jail operated with back in 2009, to a staff of three. On Thursday, Tausek and a Department of Corrections representative will be touring the facility and going over the plan with Franklin County officials. The BOC's subcommittee is expected to vote on whether to bring the jail into full operation and then forward its recommendation to the BOC, which will then vote on it. He's hopeful the BOC's decision will be made by the end of this month or early in May. Can someone please post how the general public can get in touch with these 11 members of this ridiculous committee. We need to express our dissatisfaction at their obvious incompentance. This was a stupid decision and purely political and we need to hold their feet to the fire. That is the problem in this world...we are to politically correct so you can't tell someone they are an idiot when they are one!!! Makes sense to me as a Franklin County taxpayer to put the jail back on line as a fulltime facility. Keep the money here in our county. It is time that the jail in Franklin county became a full time jail again as it is obvious that it could be run cheaper and better for staff and prisoners than shipping them out to other jails. The dapartment of corrections and all involved need to wake up and agree to Franklin county becoming a full time jail. Use common sense. Someone needs to make a bold statement about this mess. I suggest taking the prisoners into the State Capital Building and handcuffing them to the walls and leaving them. BIG turn out at the jail on Thursday and show this sub committee that this is NOT right.. We deserve better service for our tax dollars. Lance an Russell, where are you? Keep up the hard fight Sheriff, the BOC doesnt care because they are getting $600,000 from us for free to help run other jails. They don't live here, thus aren't impacted by their decisions. Pressure from yourself, the commissioners, OUR representatives and the community is more important now than ever. Isn't this part of the same crowd in Augusta that didn't pay the hospital bills? Bob's idea is the best one I have heard of so far!!!! How about a one-way bus ticket to Baldacci's house? He's the one who instituted this idiotic plan in the first place. He can get them counseling, feed 'em spaghetti, and read them a bed-time story. All will be good in the world then. We've got a good jail here in Farmington. What can that stupid committee do if prisoners are kept here in Farmington longer than the 72 hours? I like Bob's idea. Maybe the state's capitol would be a good jail. funny how whenever a crime is reported on the bulldog, people come out of the woodwork to say "lock 'em up and throw away the key," regardless of the nature of the crime. but when they find out it will cost them money, they sing a different tune! they think they have all the answers, then will the bill comes, it's "not my problem!" they want to have their cake and eat it too. How much proof do we need that smaller local govt is more effective than sending our $ out of reach to be spent ineffectively? This situation is even worse when it comes to the federal level yet the majority of this country thinks big government solutions will solve all our problems. Here is the proof! Deny it at the expense of your children's livelihood. Whats your opinion of this jail situation Jonboy? Is the $600,000 that is sent to the state county money? If so, I think the county should suspend payment to the state. Frumpleton has a point: if we have exhausted options, and relief is not to be had from Somerset or the State, then keep them in Farmington for whatever span of time is appropriate for each individual. What CAN they do about it? A little local-level civil disobedience never hurt anybody! Of course I guess the problem is, where do we get the funds to take care of these folks and their keepers ... sending the bill to Augusta won't get us anywhere ... hmmmmm..... I wonder what would happen if the citizens of Franklin County just stopped sending their money to Augusta to pay for jails, starting NOW, and diverted it locally ... ? After holding the prisoners 72 hours under the present system cut them loose. This will get the citizens of Franklin County to get the jail reinstated to a full time jail. Citizens need to say we have had anough and take action . Sometimes drastic measures get needed results. How long are citizens going to let a few tell them what is good for them. "After holding the prisoners 72 hours under the present system cut them loose…"
Okay, how crazy can we get ??? Let’s just fire all the employees in the Sheriff's department and save the money of having them catch them in the first place.. Everyone can get a gun and each man for himself. I spent time researching this last night. ALL committee members are from Southern Maine except one from Augusta. This is just wrong.. Since Somerset will not take our inmates and they are the closest without running all over the state, what woul happen if they just kept them at our jail beyond the 72 hours and thumbed our nose at the state. Interesting there are reps on the Dept of Corrections board from the jail on the coast where our inmates had to be transported. Thus they have a vested interest in keeping us hauling them down to them!. Sounds like a conflict of interest to me! Jean, thanks for researching. I hope Mr. Saviello will question why this committee is so lopsided. As for civil disobedience, too bad, but no one has the nuggets for it anymore. Look where our wimpy political correctness has landed us. Russel and I will fight on. Also it looks as though the county is gonna act on its own. So we shall keep up the pressure from as many sides as possible. This is completly unacceptable. As a 72 hour holding facility the inmates are not even able to call their families with is fine if after the 72 hours they are transfred elsewhere, but in a situation like this people with loved ones who have been in Franklin County for 5 days are stuck worring with no clue where their family member is. If the other jails in the area are unable or unwilling to house our inmates then there is no reason we should be paying or tax dollars to anyone outside our comunity when we have a perfectly good Jail sitting right here in Farmington who are having to pick up all the slack for these other facilities anyway. The core problem is too many hands in the mix from some other place. It carries no meaning to York County elected officials (one example) on the Public Safety Committee for they have a fine jail and no controversy there. Franklin County Commissioners, Town Boards, Town Managers, Police Chiefs and citizens, we all need to join with the Sheriff in voicing complaint of the situation and give support for the reinstatement of the jail. It seems that Franklin County citizen money is directed by others as they control the process. Additionally, we are providing an added half million or so that goes to MDOC. For? We do not have an answer to a supposed transparent system! Good comments by all responding to this article. The whole situation was stupid from the beginning, yet we did not support those who questioned its wisdom from the git go. The Board of Corrections, seriously, when were they last here to talk and see what is happening? Time for Franklin County citizens to step up, make noise, support the Sheriff, Commissioners, Senator Saviello and other representatives, to insist on ruling our dollars and our problems. Franklin County did not ask for this, it was a well run jail, it took care of business and then "those from afar" make a decision not based on a study or evidence, more on a whim and idea, that is wrongheaded. Government has become a short circuit of sorts and we all need to bring order to our County through our support and voices. Once local common sense and self-direction is lost, we pay dearly trying to get it back. Jean....I agree that this is wrong but the Augusta folk are trying to emulate the Washington crowd. The chair of the Legislative Committee on Inland Fisheries and Wildlife is from southern Maine and has stated that he does not hunt nor fish. Guess what party is in "charge?" It must be time to turn maine into two states, northern maine for "mainers", and southern maine the "mass mainers". Let the city folk vote for their way of life, and "we" can vote for ours.example. Why would we allow folks living in apartments in portland that don't hunt,never had a license to do so, keep us from hunting on sunday. Just sayin! "How Absurd" is right. Good idea. We would save a lot of money. For those interested in uniting and fighting this, please go to the Facebook page Give Franklin County our Jail Back. There you will find information regarding an important BOC meeting being tomorrow. Feel free to send a letter to BOC chairman, Mark Westrum mwestrum@tbrj.org regarding your thoughts on the BOCs lack of action. how is that school and jail consolidation working for ya? almost 500 new fans in just 24 hours. Return Jail back to full time! If the jail had been kept up the past several years, maybe the result would be different.